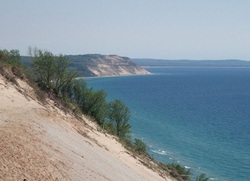 As a teenager I spent my summers in Leelanau county at my grandparents cottage on Lake Leelanau. My grandfather was a high school manual arts teacher in Cincinnati and my mother was an artistic kindergarten teacher. We always had craft projects from knitting, sewing, macrame, to beading. I started collecting stones & beach glass along the Lake Michigan shore as a child and creating and selling jewelry art in 1973. ​Now I live in Cedar near Sugar Loaf Mountain and can enjoy the lakes and beautiful area all year long!